Ramada Plaza Jeju Hotel, modeled after a deluxe cruise ship, floats on the waterfront of Jeju Island. This floating hotel, the only one of its kind in Korea, is reached in just five minutes from both Jeju harbor and Jeju International Airport. Blessed with picturesque landscape and sea scape, Ramada Plaza Jeju hotel transcends its location to become a premier destination for visitors from home and abroad. Totaling 66,000�� of floor area, 380 guest rooms are composed of 20 traditional Korean-style and 323 Western-style room, 12 suites, 20 kids suites, 3 platinum suites, and 1 presidential suite. A kids suite, the first introduced in Korea, offers benefits to both children and their parents with its comfortablespace for play and rest. VIP guest rooms on the 9th floor feature face identification door keys and a wall mounted flat LCD TV. A Ramada Plaza Jeju Hotel (ACED2014 Conference Hotel) 0m (0 min) KRW 150,000 (Mountain View) KRW 170,000 (Ocean View) http://www.ramadajeju. 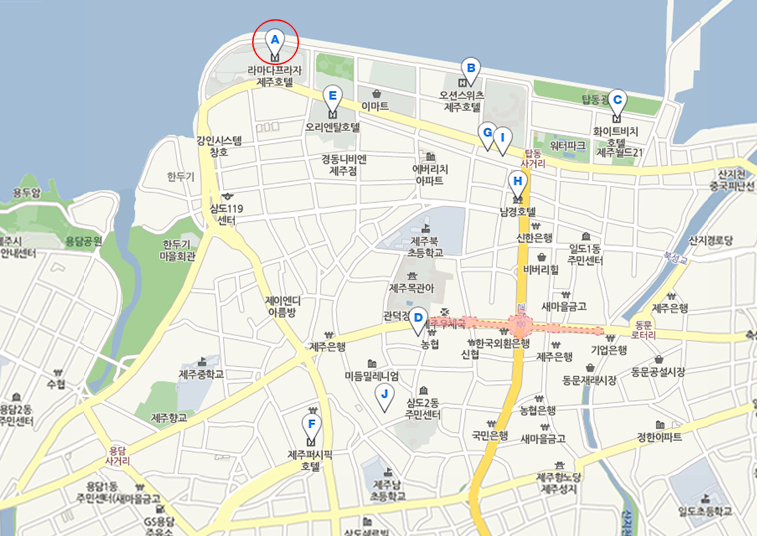 E Jeju Oriental Hotel 200m (3 min) KRW 170,000 http://english.oriental. F Jeju Pacific Hotel 1200m (20 min) KRW 160,000 http://www.jejupacific.